The Schleswig-Holstein War of 1864 was not just a fight for territory, but also a debate over the concept of the nation. The Jutland peninsula in 1864. The area in red was Danish prior to that year. The television series 1864, directed by Ole Bornedal and based on books by historian Tom Buk-Swienty, has followed The Killing and Borgen in becoming a successful Danish export. But 1864 is neither Scandi-noir nor political intrigue. It is a period drama that takes up one of the central moments in Danish history, a defeat that continues to shape debates about Denmark's role in the world today. It is precisely for this reason that the series has provoked considerable controversy in Denmark. What is fascinating for an outsider – especially a historian – is the glimpse that this series provides into Danish historical memory. After all, outside of Denmark, few remember the war at all. Outside of Schleswig-Holstein, the territories fought over in the war, the conflict barely registers in the German and Austrian public consciousness. And yet, at the time, the 'Schleswig Question' was the cause célèbre of the German nationalist movement. It is worth looking back to see why 1864 was so important at the time and whether it has a significance that should be better appreciated. 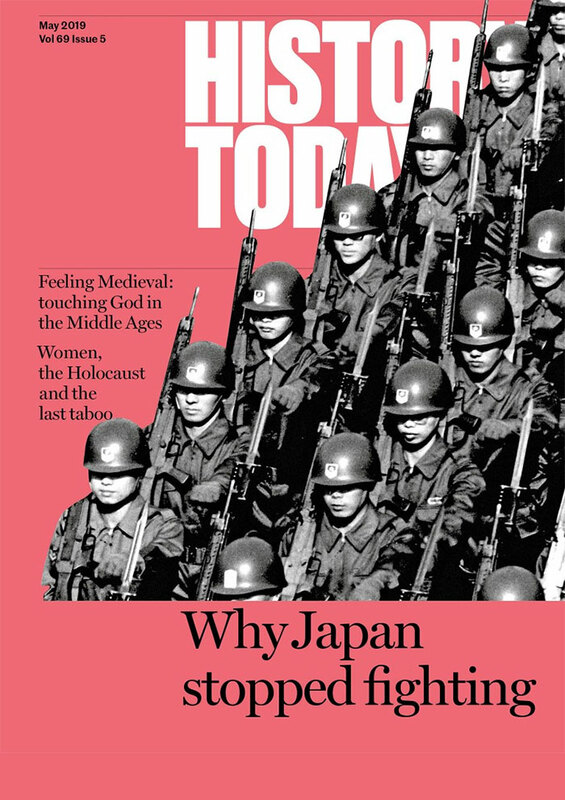 What do people today typically know about the war's role in German history? With the gift of hindsight, it became the 'first' war of unification, but a minor one that was quickly eclipsed by the German civil war and the war against the eternal French enemy. Look into most German history textbooks, and the war features as the 'Iron Chancellor' Otto von Bismarck's first cynical gambit, the first step of a master plan that allowed him to co-opt the nationalist cause and establish an authoritarian German state under Kaiser Wilhelm I. Overshadowed by wars against Austria and France, the 'Schleswig Question' quickly became little more than a footnote in the story of Bismarck's tactical genius. But there's more to the Schleswig Question than this. Put simply, 1864 helps us to see the origins of the modern liberal nation-state. By this I do not mean the 'unification' of one particular state or another but rather a certain logic built into state policy and civil society in this period. This logic was based on liberatory, universalist notions, for example, everyone has access to rights, and social problems can be overcome through active participation in society and the application of technical expertise. But it was also built on implicit assumptions about who was actually fit to exercise those rights and whose expertise was most valued. Calls for individual freedom were countered by concerns that internal difference could undermine the stability of society and thus had to be regulated. For many politicians, commentators, and reformers, then, assimilation and loyalty to the nation were the chief issues of the day, not least because the new German nation-state was anything but homogenous. Looked at from this perspective, Bismarck's wars did not mark the successful unification of Germany but rather only the beginning of efforts to forge a unified German nation-state, with implications that reach to the present-day. Seeing how 1864 opened this era requires us to turn our attention away from Bismarck for a moment and toward the German liberal nationalist politicians and activists who worked first against and later with him to shape the Imperial German state. We need to see what motivated them and what they achieved. By the 1860s, conflict between Germans and Denmark over the duchies of Schleswig and Holstein had been the most important nationalist issue for two decades. Schleswig and Holstein were properties of the Danish crown, and from 1840 they were subjected to a series of reforms intended to rationalise administration, to integrate the German-speaking territories more directly into the central state, and to undermine the local authority of German-speaking elites through a Danishisation of education and administration. These policies alienated local German-speakers and fuelled the indignation of German nationalists throughout the German lands. They saw their compatriots under Danish rule as victims of a crime against the Volk, unable to exercise their god-given right to express and pass on their innate German character. The general outrage over the situation in Schleswig and Holstein made for an effective mobilisation tool, and liberal nationalists across the German lands used it to level a broader attack on their political enemies at home. They blamed Germany's political fragmentation for the situation and criticised Prussia, Austria and the German Confederation for being unable or unwilling to respond to the demands of the people. Only a unified, representative government could mobilise the nation's strength and save their besieged comrades. The link between parliamentary governance and national strength is important to keep in mind, since for liberals in the various German states they were inseparable. After all, at its heart political liberalism was a rejection of the formal legal inequalities that had governed the Old Regime. Aristocrats claimed privilege based on inherited rights and responsibilities, while liberals insisted on inalienable rights, constitutional government and popular political participation. They justified these demands with reference to 'the people', understood as an egalitarian community linked by timeless, organic bonds of culture and language. Of course, in the process liberal nationalists made a claim for their own fitness to rule based on their familiarity with the 'national' tradition, their wealth and property, their education and technical expertise, their embrace of rationalisation and capitalist modernisation, and a certain bourgeois respectability. In their rhetoric lay a tension between universal rights and the insistence that not all were equally fit to participate in society. The peasants, workers, women, youth and – most appropriately here – national and religious minorities who did not have the proper virtues had to be 'civilised', just as surely as did 'savage' peoples around the globe. Liberals' faith that they were on the side of progress fueled an impulse to re-shape the population according to their ideals and in the service of their vision of modernity. After 1864, Bismarck was willing to facilitate liberals in their pursuit of this project and forged a temporary alliance that incorporated elements of liberalism into the German state. Bismarck made this choice because, by the 1860s, German liberals had built an impressive base of political support and had achieved significant electoral successes. It is easy to forget that it was a crisis caused by liberals' strength that brought Bismarck to prominence in the first place. In Prussia in 1862, an impasse over the expansion of the army almost led King Wilhelm I to abdicate; Bismarck's appointment in that year was a final attempt to escape the crisis with royal prerogatives intact. So Bismarck's maneuvering with Denmark less than two years later must be understood in the context of his dance with liberals in Berlin. Among other things, he needed to convince them that he was the least of all evils, a man they could work with in the short term and still achieve their long-term goals. He was successful in this because liberals believed that history was moving in their direction and away from the forces of reaction. The fact that Bismarck was no nationalist and was able to abandon his alliance with liberals by the end of the 1870s should not lead us to assume that their efforts simply failed. In concert with Bismarck, they had achieved a nation-state with constitutional governance based, at the national level, on universal manhood suffrage and the principle of legal equality – central liberal demands. 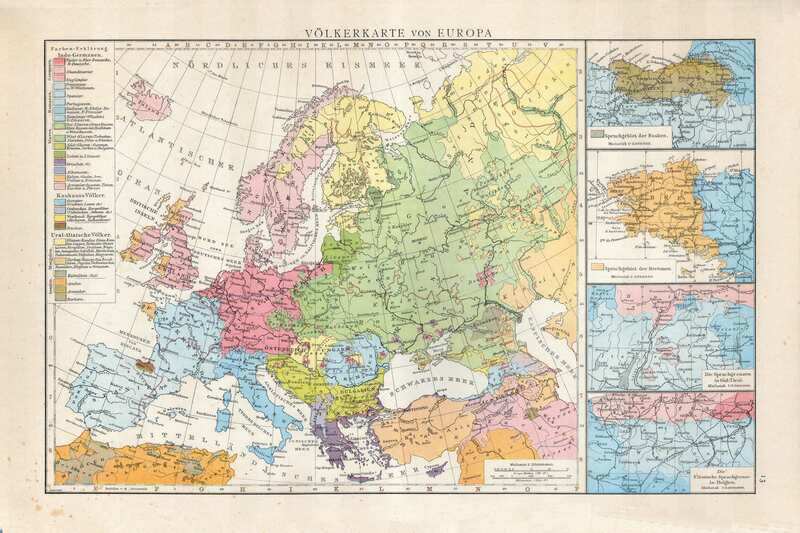 Further, liberal nationalists established models of national belonging that continued to direct attitudes toward minorities and the marginal long after Bismarck was gone. If we look at what happened after the defeat of Denmark, we can see how intertwined were the interests of liberals and the state. After 1864, local officials in Schleswig and Holstein gradually subjected Danish-speakers to the same processes as had been directed at German-speakers in the years before, restricting the use of Danish in schools, the press and on stage. German nationalist pressure groups came in to challenge Danish nationalists and also to make sure that any local Schleswig-Holstein identity did not tear at the fabric of the new national state. As the region became integrated into the German political system, national parties came to dominate, but local passions continued to shape policy. By the late 1880s and 1890s, fears of Danish nationalist organisation and political influence led to ever harsher restrictions on bilingual teaching and, in 1898, the mass expulsion of over well over 1,000 Danish citizens. The localised effort to enforce uniformity and loyalty in Schleswig and Holstein was part of extensive campaigns against others deemed 'outside' the national community. In campaigns whose language is not unfamiliar today, Bismarck and liberals vigorously pursued a Kulturkampf against Catholics, whose 'backward' culture and international connections made their loyalties suspect. Socialists were hounded as radical 'terrorists' and subject to extreme limits on their activity. Germanisation policies were aggressively used to encourage non-Germans in Alsace-Lorraine and in Prussian Poland to 'assimilate' and to fight the presumed danger of 'foreign' influences undermining national cohesion. Controversial mass expulsions from Germany were carried out against troublesome political enemies and ethnic outsiders, whether Jesuits, socialists, Poles, Danes, Jews, 'Gypsies' or French. All of these measures were heavily contested, especially by socialists and Catholics and minority parties who had been subject to them at one point or another, because at their heart they were fights over how to reconcile particular cultural affiliations and the rights of citizenship. For most liberals, the ultimate goal remained assimilation into their vision of the German nation, even if for some the severity of the measures deserved the sharpest approbation. The various efforts to enforce national uniformity had the paradoxical effect of reinforcing national divisions. The effort to draw neat lines on maps between one language group and another belies the reality of the situation on the ground, where identities were generally much more fluid. People spoke multiple languages and used them in different contexts, had close relationships and intermarried. Border territories like Schleswig and Holstein were hybrid spaces, but nationalisation forced people to choose sides, making fluid identities ever more rigid and fuelling nationalist activism. This process was not unique to Germany but was happening all across Europe. Russian officials tried to 'Russify' their minorities, while Hungarians tried to 'Magyarise' theirs. Austrian German nationalists battled Czechs and Italians, while the British fought with the Irish. The French and the Italians considered a regional patois an atavism that modernisation would necessarily consign to the past. Like so many things, the Great War made the question of national uniformity more troubling. In Schleswig and Holstein concerns over Danish loyalties led to nationalist leaders being interned. After Germany's defeat, residents were given the opportunity to vote on which state they would belong to. 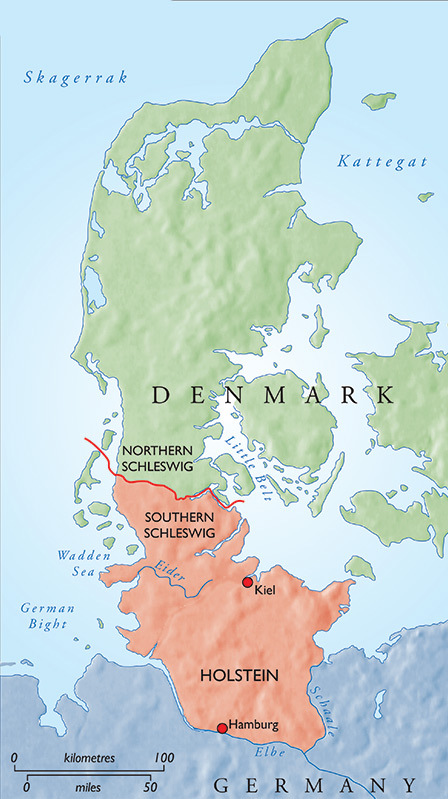 Unsurprisingly, in 1920 the predominantly Danish-speaking North Schleswig joined Denmark, while the rest of Schleswig and Holstein stayed with Germany, resolving the tensions that had provoked war in 1864. In one sense, this was a victory for democracy, but it also pointed to a worrying future. Raising national self-determination to the level of international law meant accepting the premise that nation-states should be homogenous. This assumption led to extraordinary violence across central and eastern Europe in the 1920s and 1930s as diverse states tried to distinguish between desirable insiders and outsiders to be marginalised, furthering the polarisation of national identities in borderlands. Hitler's vision was only the most radical of many visions of national cohesion turned into a central goal of state policy in the interwar period. 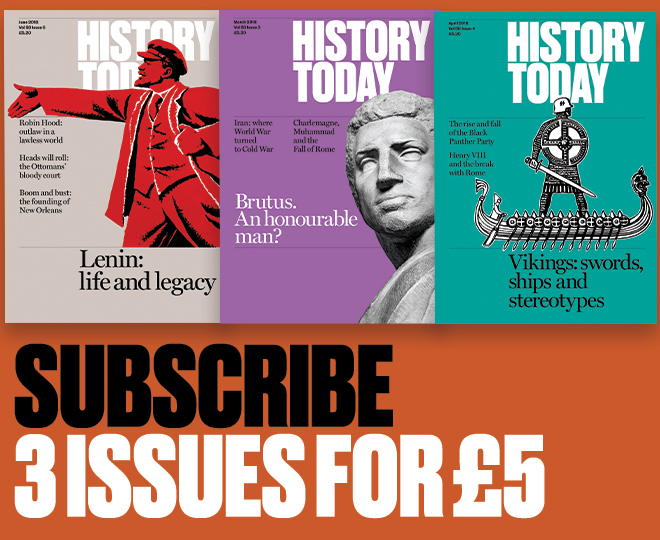 Looked at from this angle, 1864 is not just a story about diplomacy or about Bismarck's 'blood and iron', and it is more than just a story about the tragedies of one state's rise and another's decline. It helps us see the rise of the liberal nation-state, its origins in a utopian vision of a uniform national community that could never match the complexity of the people living within it. This is an issue that is clearly still relevant to Germany and Europe today. As we struggle to define our various 'nations' in an era of increasing movement throughout Europe and around the globe, we grapple with the same fundamental question that exercised opinion on Schleswig and Holstein in the nineteenth century: What sorts of difference – and how much of it – can the 'nation' incorporate? Jeff Bowersox is Lecturer in Modern German History at University College London. His book, Raising Germans in the Age of Empire (Oxford University Press, 2013), is out now.